Danilo Lozano, flute soloist, musical director, record producer, and educator performs both innovative and accessible music by Latin American, African American, Latin Jazz, and Cuban composers as well as rarely heard pieces of the classical and contemporary repertoire. As founding member of the Hollywood Bowl Orchestra he recorded on all Hollywood Bowl releases and is a featured soloist in many Grammy nominated Latin Jazz and Cuban charanga recordings. He is a featured soloist on legendary Cuban bassist Israel Lopez Cachao and the Cineson All Stars double Grammy award winning CD release entitled “Ahora Si” on the Univision Record Label/Cineson productions. Lozano has also been involved in Narada Productions’ critically acclaimed “Cuba LA” project as musical director and flutist, and as musical director of Edward James Olmos’ PBS Special “Americanos”; the latter having earned an Imagen Award in 2000. Most recently, Danilo serves as both Musical Director and flute soloist with Jose Rizo’s prestigious Jazz on the Latin Side All Stars and can be heard on their CDs “The Last Bullfighter” and “Tambolero” on the Saungu Record Label. Lozano also serves as Musical Director and flutist with Andy Garcia’s Cineson All Stars. With Cineson productions he also acted and recorded on Mr. Garcia’s film directorial debut “The Lost City.” He also recorded and produced composer Teresa LeVelle’s The Shadowlands on Innova records. Although he has performed and recorded with such international musical greats as Linda Ronstadt, Paquito D’ Rivera, Celia Cruz, James Newton, and with many other artists and ensembles, Lozano has maintained a personal commitment to education. 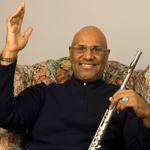 He has taught at the Los Angeles County High School for the Arts, The University of California Los Angeles, California State Polytechnic University Pomona, California State University Los Angeles’ afro-Latin Master’s degree program, and is currently a Professor of Ethnomusicology and Flute Artist-in-Residence at Whittier College.